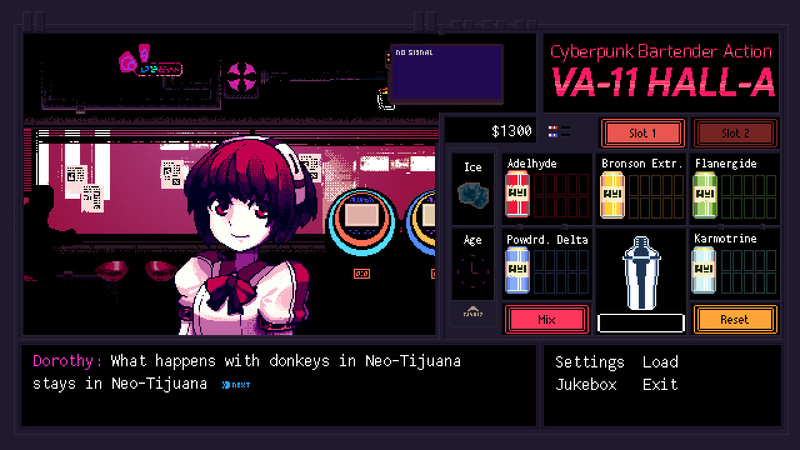 Gaining cult success around the more niche areas of the Internet, VA-11 HALL-A, a cyberpunk bartending simulator, has managed to stir up quite a fuss. Originally created as part of a cyberpunk game jam, it proved so popular that the developer's making it into a full blown game. Prepping up to its final release, a new trailer was shown off at GDC this week, revealing a Vita version ported by Wolfgames. Set in a world where humans are infected with nanomachines set to repress them, you explore the lives of the customers who frequent the establishment. We all know that the best stories are those heard in a pub, so we hope that this title will be no exception. While no release date is set just yet, developer Sukeban Games is being very open and vocal about the project on its blog, stating that a release will most likely follow the PC counterpart. If you want to see the game in action, check out the trailer embedded below. Do you prefer your simulators shaken and not stirred? Pull up a stool in the comments section below. Amazing concept. Definitely eager to give this a look. That's why i like indie games, they try for something new and/or different. If the price is nice I'll give it a try. @Melucine Yeah, we've been talking about this a lot at Push Square Towers. Not everything comes out great, but the risk is low — I suspect this game will be $15 or less — so it's easy to take a chance on titles like this. Not sure if you mean low risk for the costumers or the deviants. As a costumer, I am more willing to risk it with a cheap indie game than an expensive one and let's face it, retail titles are not always fun. Non-indie deviants are less prone to take a risk and it's natural imo. People are eager to blame companies like EA for making "safe" games like DoC, but they must also consider how many employees those companies pay. @Melucine Both really. Developers aren't investing tens of millions, so can take a risk on the concept; consumers aren't being asked to pod out $60, so can take a risk buying it. This will be a why not, buy for me. I love to try new gameplay styles. URGENT,,,,,,,,,,,,,,,,,, do you need your ex back? are you in poverty? female goddess of jai mata, Daughter of Durga queen of the universe. you except you contact Sunlight i contacted so many of them. spellcaster. i have been through but it is a great thing sharing my happiness.